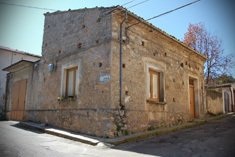 Welcome to the web site of "A HOUSE in SAN BASILE"
The project "A HOUSE in SAN BASILE" is the idea through which the Local Council of San Basile (CS) intends to promote the fruition and the reuse of many uninhabited houses placed in the town. This site means to promote and advertise all the information that will be helpful to anyone who wants to buy or rent a house in San Basile. The Local Council will just disseminate this project and put in touch potential purchasers with the buildings' owners, who will be the only negotiators.